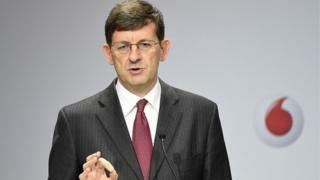 Vodafone's chief executive has warned Britain risks exclusion from plans for a giant new single market in digital services if it votes to leave the European Union. The EU is expected to publish proposals for the new digital single market later this year. Vittorio Colao told the BBC it would be a missed opportunity if Britain "tried to sit outside". He said Britain could participate, but not help write the rules. "The next big opportunity is in digital. Britain is particularly strong in digital, and it would be a missed opportunity if it tried to sit outside," he told the BBC's Today programme. Mr Colao said Britain would not be able to influence important decisions on copyright, e-commerce and and cyber security. "There is a difference between being a neighbour and being a co-owner," he added. He said Germany had gained huge benefits from the current single market through the export of its goods and that Britain could do the same with its digital expertise. Vodafone is the seventh largest company listed on the London market, with operations in 26 countries and about 100,000 staff. Britain accounts for about 10% of its profits and sales. Mr Colao also hinted that FTSE 100 companies such as Vodafone could move their headquarters out of Britain if it left the EU. He said Vodafone was very happy here, but it would have to reconsider its position if the free movement of people and capital was restricted.